It's been a huge couple of weeks for home entertainment announcements, with Panasonic, Samsung and Hisense all revealing their AV product lineups for Australia in 2018. Now, LG has come out swinging, launching its first ever smart speaker, its new range of OLED TVs and its latest soundbars for the year — all of which are powered by its AI technology, ThinQ. Next up is LG's Super UHD TV range, which employs nano cell technology and full array dimming backlighting (selected models only) to provide enhanced image rendering and deep blacks. 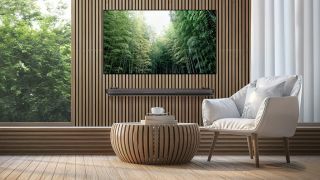 Along with its TV announcements, LG also debuted its first ever smart speaker, as well as its refreshed range of soundbars — many of which are now Dolby Atmos-capable. The LG WK7 AI ThinQ Speaker is the company's first Google-powered smart speaker with voice control functionality, which has been developed in partnership with Meridian Audio, offering hi-res sound quality. Available from mid-April, the LG WK7 AI ThinQ will be priced at $299. LG also announced a new lineup of soundbars for 2018, as well as a pair of rear speakers (SPK8) priced at $199 that work in conjunction with the soundbars to provide a more immersive audio experience. At the top of the range is the SK10Y soundbar, which boasts Dolby Atmos support, high resolution audio from Meridian Audio, ThinQ functionality, 550W output and support for 5.1.2 channels. That's priced at $1,699. LG's SK9Y and SK8Y soundbars also offer Dolby Atmos sound and Google Assistant compatibility. The former is priced at $1,499 and is capable of 500W of output, while the latter can knock out 360W and will set you back $999.